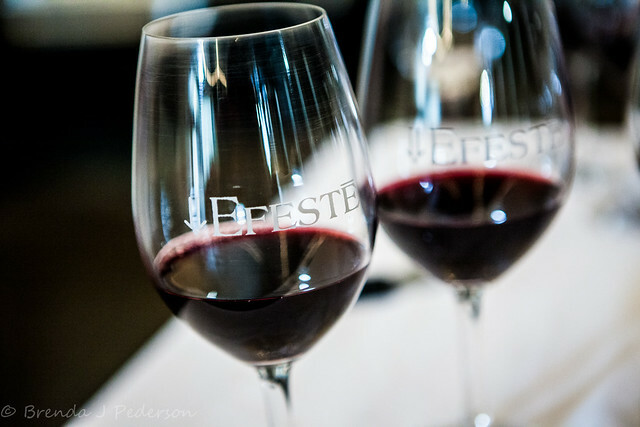 EFESTĒ (pronounced like the letters, F-S-T) is one of the Washington wineries with a tasting room in the Woodinville warehouse district. The tasting room sits behind a couple of warehouses and up a long driveway off of 144th. It is warm and welcoming with large windows bringing light into the large space. There’s a stand-up bar, as well as, a variety of chairs and tables providing plenty of options and space for tasting. But the tasting room was not my destination on this visit. EFESTĒ is trying out a new sort of tasting they plan to offer soon. A few of us assembled in the tank room for a combined vertical/barrel tasting. 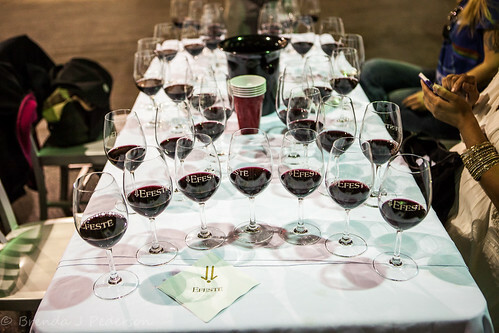 This tasting focused on Big Papa, EFESTĒ’s 100% Cabernet Sauvignon wine. 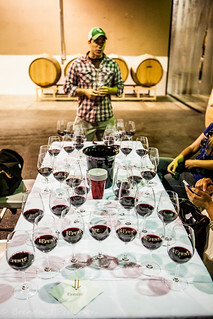 The tasting was led by Peter Devison (scroll down, then select his name under Our Team), EFESTĒ’s winemaker. While we tasted, Peter, a great speaker and storyteller, talked to us about what we were tasting; where he thought the wine was, in terms of drinkability; the characteristics; and other winery and wine making tidbits. First we started with bottled wines to set the baseline. Our first wine was the Big Papa 2008, a big, bold wine with tons of structure, rich black currant flavor, and strong tannin. This wine demands a big, meaty steak to pair with it and will easily handle a few more years in bottle before reaching its peak. Next we tasted the 2011. This wine was only bottled a year ago and is still in process of coming together. It had a much fresher taste than the 2008, tannin was barely detectable, and I did not find it nearly as complex as the 2008. Peter does not believe it will age as long, either. We then moved on to the 2012, which had only been bottled last week. Tasting wine at this stage is a little bit unfair to the wine, as it hasn’t recovered from the shock from bottling. Having said that, this is a nice wine that will only get better as it settles down. A lot of fruit, but also more structure than the 2011. It will be interesting to see how it ends up comparing to the 2008. Then we moved on to the fun part. Our next four wines were barrel samples that could be used to create the 2013 Big Papa. 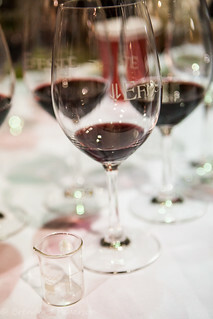 While they were all Cabernet Sauvignon, each of the samples was from a different vineyard and/or AVA. Each had its own set of characteristics that it would bring to a finished wine. I find the process of selecting and blending wines fascinating. Although it parallels cooking in many ways, I can’t seem to get my head around what elements in one wine will complement (or not…) elements in another wine. Although I’m sure much of that comes from experience, this is the skill that makes a great winemaker. We tasted and talked about the four samples, individually, and then tried our hand at creating our own blend. While I didn’t create anything worth writing home about, I loved the process of experimenting to see what I could come up with. EFESTĒ plans to offer this event again on July 11th. Wine Club members and those on their mailing list will get first notice. The events will be limited to small groups so, if you are interested, sign-up for their newsletter! You can also follow them on Facebook or Twitter, but event notifications go to Wine Club and newsletter subscribers first.